Hi! Welcome to our house! 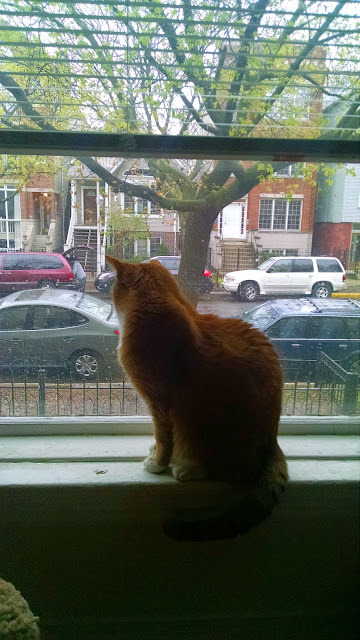 This is the view from the front window where the cat likes to watch the world go by. When I was writing this post about our house, I had a lot more to write but blogger somehow crashed and I lost a lot of work. When I first realized I'd probably be moving in here (March, almost a year ago) I got interested in the history of the house. 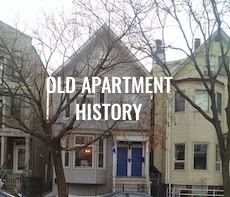 I read this blog a lot and was super impressed by how Daniel tried to keep his (extensive, insane) home renovations true to the historic character of his 1865 house, and the other properties he worked on (because one home reno isn't enough?) Plus I like watching a lot of HGTV when I'm on vacation. Anyhow I wondered how to identify the age of the house and the general architectural style. I looked at some books and pamphlets about Chicago architectural styles - Georgian, Edwardian, Victorian, bungalow, American Four Square, Dutch Colonial, etc. This article pretty clearly describes the "frame two-flat" but said the era varies from 1900 - 1920 and could be in a variety of architectural styles. Ours looked similar-ish to the illustrated Victorian, with the bay windows and dormered little front porch off to one side. But the descriptions of other architectural styles seemed to sometimes fit too. The exterior of our house has been covered in vinyl siding like most old houses around here, making it a bit harder to really tell what it used to look like. Then I remembered that our moldings around the windows and doors looked a lot like the windows in Daniel's old Brooklyn apartment, and he had said they were original and 120 years old, and that was in 2011. 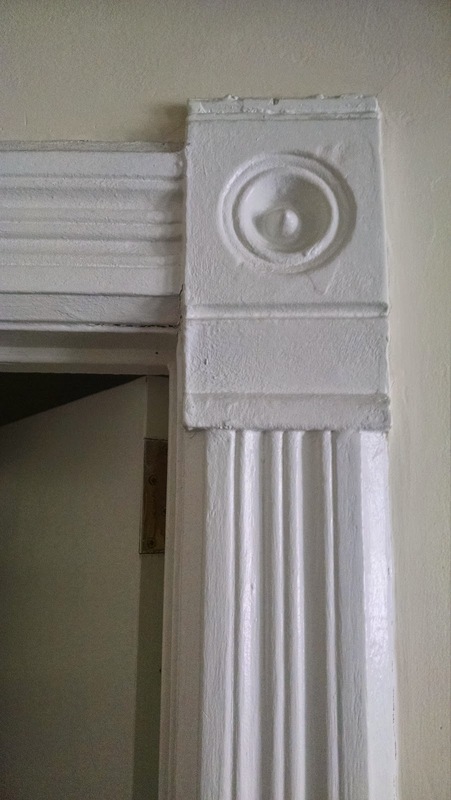 So I googled around trying to describe them correctly until I found some images of molding that looked just like ours with the date of the house they were found in. That confirmed the general ballpark era, and I was able to search around more effectively. I decided on 1887 although never could find the original building permit. Here's the first picture I took of the moldings, you can kindof see here where I think someone sawed off (?!) the top bit which is like a little crown. I remember reading somewhere that back in period the house was built the moldings likely would have been painted white with patterened wallpaper on the plaster walls. The walls are still plaster but full of cracks, so many cracks. I am afraid fixing them is going to end up really expensive. If you look closely in this picture, you can see the little crown. Sorry about the poor contrast in the photo, white on white was hard to capture well. First of all, I don't know why some of the trim has no crown and others do. The kitchen only has basic, boring trim around its three doors and two windows but it does have the super tall grooved baseboards the rest of the house is #blessed with. Second of all, look even more closely at the picture above and notice how the trim on the right side of the closet (that's my closet, you can see my striped dress poking out of the darkness) just disappears into the wall. WTF. This really gave me pause, because I was so convinced that the trim and walls were original and I couldn't imagine why they would have just designed it like this. It just looks so much like an afterthought, like they wanted a closet and put it in and then they were like oh, crap, the trim doesn't fit here, let's just cut it off, no one will notice. By the way, see how narrow this closet is? There was a folding door in there (you can see the tracks for it) but when folded, it took up precious inches and wall space, so I took it off. We don't use this room as a bedroom so it's ok with me to have it open (you know if you have your closet door open at night that's how the monsters get you). I'll show you my closet some time, it is a work of art how I squeezed everything in this tiny narrow space. 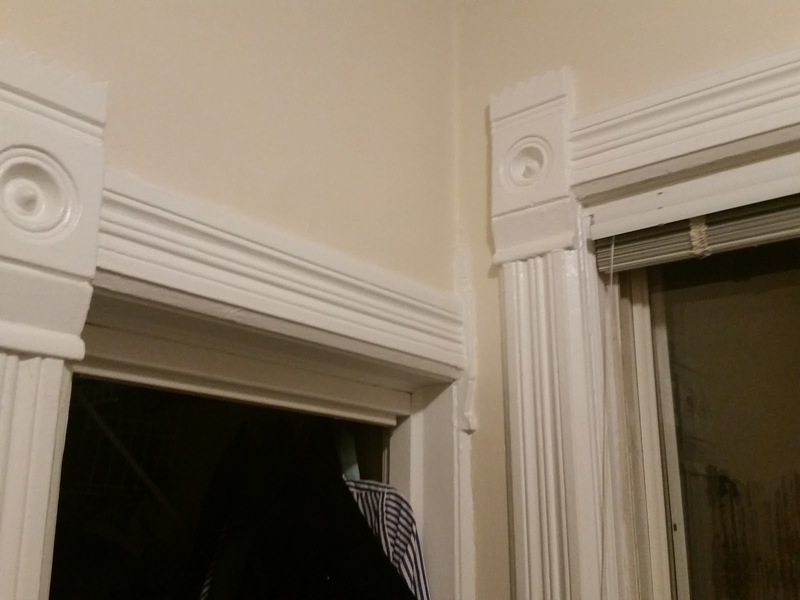 Back to the topic at hand, which is the crazy things going on with the trim in this house. Ok, this is basically my view right now, lying in bed, except we now have an IKEA light fixture instead of this broken sad thing. The acoustic tile drop ceiling is horrifying and I hate it. I especially hate the parts that are coming loose. But I can't do anything about it, and that's not the point of the picture. The point is where the diagonal line of the bottom of the staircase that that leads up into the neighbor's place cuts off the window trim. Daniel, my hero from Manhattan Nest, dealt with a similar situation on the outside of his house, and concluded that the windows were added later, disrupting the trim line, and so I wanted to conclude that the plastering over of the stairwell bottom was a later addition, but after noticing the closet trim abnormality in the spare room, I am wondering if the original builders were just not as detail-orientated as they should could have been. I mean, it was a working class dwelling, built probably pretty quickly in a subdivided urban lot with a lot of basically identical working-class dwellings. I was raised in the 1990s version of this, and let me tell you that the builders are not always perfect artisans. However, the tract home nature of the house makes me think, wouldn't they have worked out the kinks if they were working on a plan that they did over and over again? But then again, I think that the original owner was a carpenter. Maybe, just maybe, he decided to take the plans into his own hands, but messed up a few details. I really like this idea. I now have a whole personality in my head for him (basically the dad from Home Improvements). 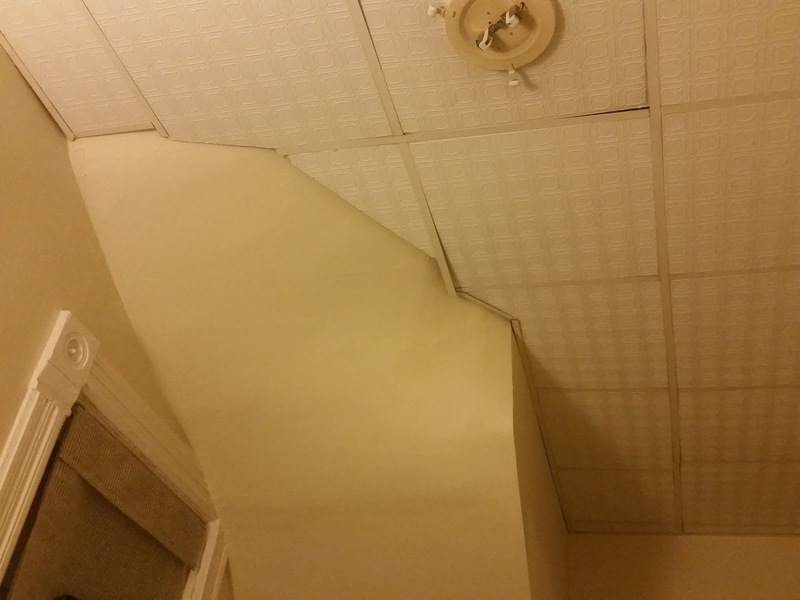 Now that I showed you the terrible ceiling in my bedroom, I might as well show you the even darker underbelly of it, as a further example of the madness that went into the multiple renovations of this old house. The light fixture that was here when my husband moved in (before I met him) was an ugly frosted glass dome with flowers etched on it that was held flush to the horrible ceiling with the three hook looking things you can see in the picture. One day the bulb blew out and I discovered it was a weird-looking tiny halogen tube. We didn't replace it for, like, a month. I went to Ace Hardware (which is located next to an Ulta, Kinko's, Pizza Hut, my phone carrier, and a coffee shop and across the street from Binny's making it basically the most amazing shopping strip ever) and found the bulb but it was kinda pricey and I hate the light fixture anyway, so I convinced husband we could replace the whole fixture, no problem. I wanted to install in the bedroom the chandelier which I had gotten him to help me install in the kitchen, and in the kitchen I would put a globe light I'd been carrying around for years since I found it in a dumpster. This is making me sound crazy and kind of awful, I know. 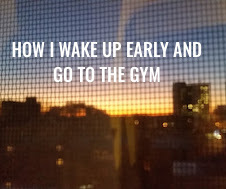 However, that plan was not to be. We took down the ceiling tile to assess how possible it would be to install the chandelier and found the scene above. The yellow line of wire comes from the light box, which is sensibly mounted into the ceiling, travels about a foot or so horizontally, and then goes through the foam-board ceiling tile to attach to the light fixture. The whole weight of the fixture is just hanging on the quarter-inch or less of foam tile that hangs on the cross-bars, which as you saw are not all attached to the wall and basically falling down. 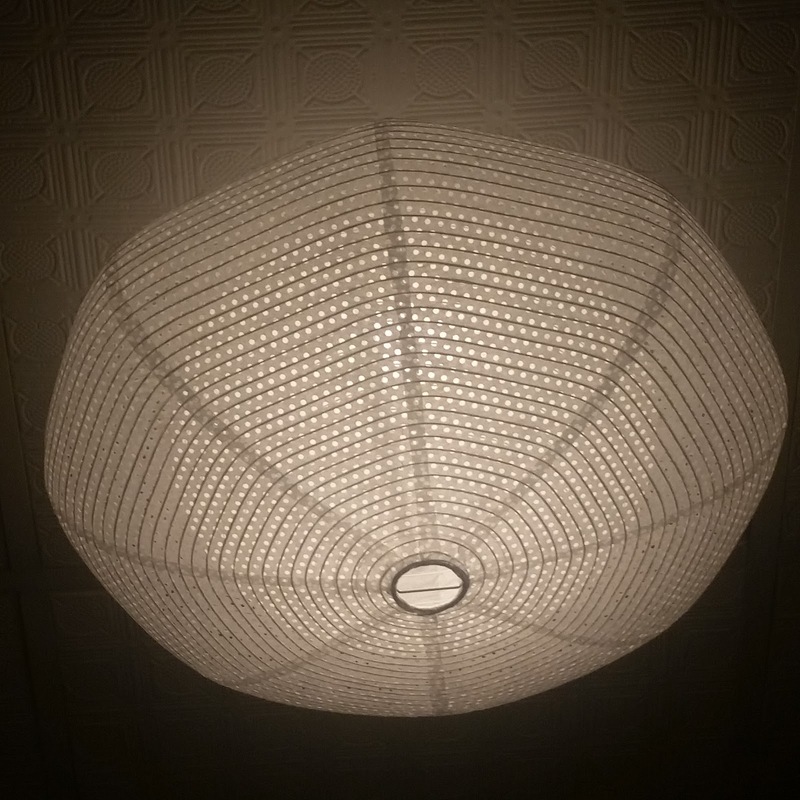 I reassessed my plan and decided to get something extremely lightweight and something that would detract attention from the ceiling instead of attract it, which in retrospect was a way better plan and a chandelier would have been a terrible mistake. So we went to IKEA. It was amazing as it always is. I drank a bunch of coffee and bounced off the walls but managed to choose this funny paper lamp. Husband said he thinks his parents had a similar one in a different shape in the 80s, and it does have a sort of retro-futuristic style that I don't hate. Its a very different style from the classic 1880s/90s style that I was going for, but it gets the job done, weighs basically nothing, and has a lasts-forever LED lightbulb. I actually like how the dots on it mirror the dots in the ceiling tile pattern. Since we aren't going to remove and replace the drop ceiling anytime soon if ever, it seems a decent compromise. 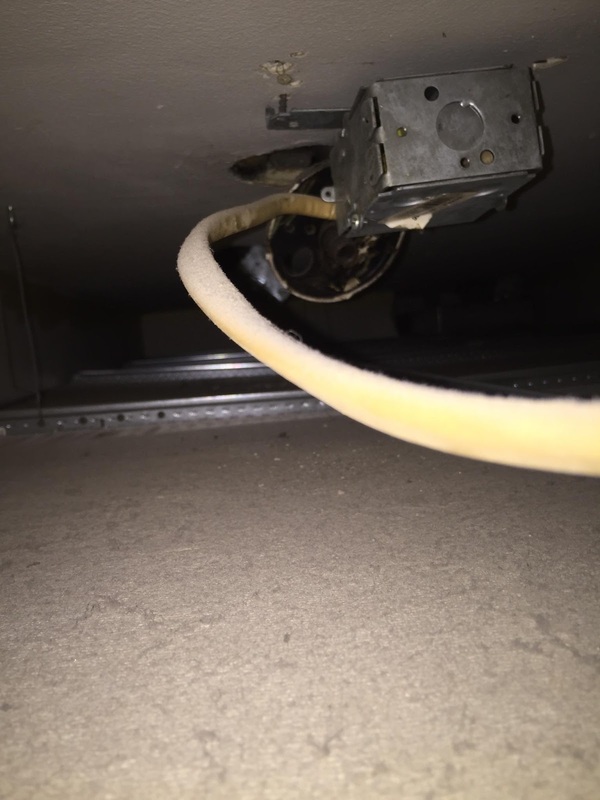 Once I saw what lies beneath the drop ceiling, which is open ductwork and pipes and a horrific collection of dusty wiring, I see why there is a drop ceiling, and lost interest in trying to tear it down. And after a month of crashing into stuff in the dark trying to get to the bedside lamps, having an overhead light is amazing. 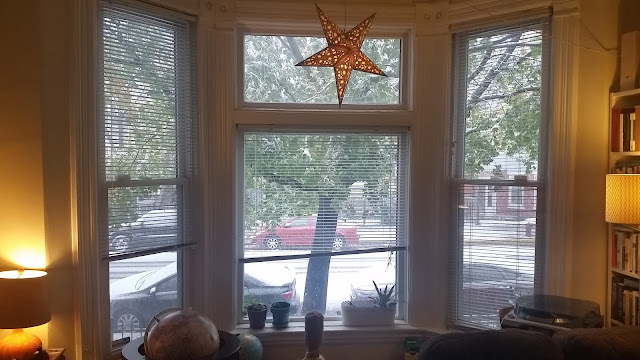 Here's some more pictures of the living room windows to apologize for making you look at the atrocities behind the ceiling tile. You can get a shot of our bay window, which is a pretty cool thing to have, actually. We are about half-a-story above street level, so we don't get a lot of light, but this window really maximizes what we do get. It's kinda messy; we've made some changes recently since we got terrariums for a wedding present! The cat and his paraphernalia get pride of place. You can see in the top photo the white globe on the floor. Around the time I was in grad school I walked past a dumpster outside one of the 1960s era buildings that was getting some mild renovations and they had tossed out some glass dome light shades. I took three -- two like this white one and one really huge, beautiful gray smokey glass. One white one broke almost immediately, all over my former roommate's apartment building lobby. The gray one went with me to several more apartments, used as a vase, a source of Darth Vader voices, and eventually I dropped something on it and it cracked. However, I knew I could use this globe and it would be worth it, but I needed lamp parts. I tried a lot of places: Ace, Home Depot, and a lighting store. I was finally directed to Midwest Lamp Parts, which is in a giant warehouse in a random part of town. We went over one day only to learn they are only open 9-5 Monday-Friday unless they feel like closing up for a few days randomly. Finally, ages later, I was sick enough to stay home from work but well enough to get in the car and drive over there. 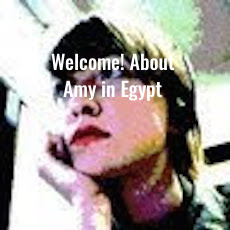 I was a little shaky and felt weak and feverish but I am very committed to this project. 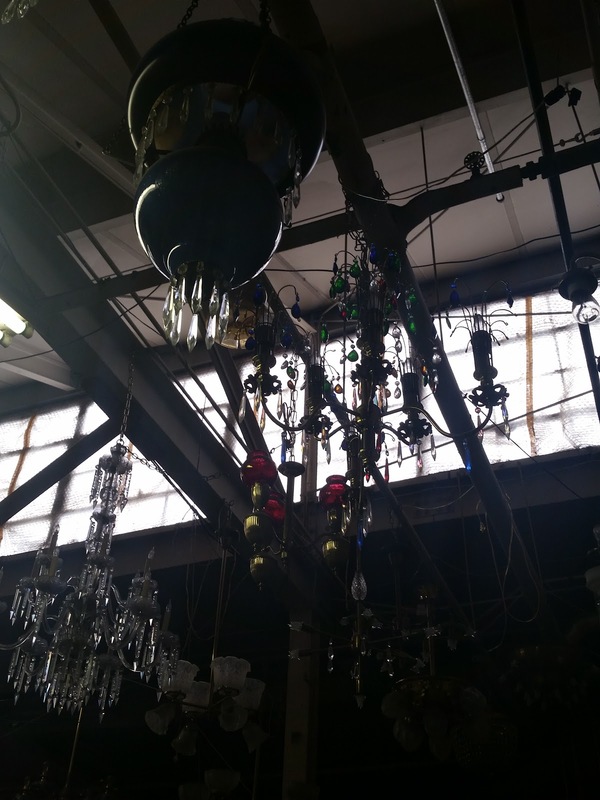 It was amazing, dusty, jam-packed with light fixtures and well, lamp parts. I was helped by a Russian-sounding Orthodox Jewish man who at first seemed grumpy and was annoyed with me for not knowing the names of the parts I was looking for, but turned out to be awesome and nice once he realized I was planning to do all this myself. He made me an honorary construction company when he wrote up my invoice on a carbon copy machine. Cash only, of course. At this point I was still planning to put the chandelier in the bedroom so I got a whole new chain, ceiling mounting hardware, etc. Putting this light fixture in was... difficult. Husband was not happy with me, because I can't reach the ceiling even on the ladder so he had to do all the hard work... four times because we couldn't get it right. It took hours, with lots of going down to the basement and back up to flip the breaker switch. There were a LOT of parts to get in the right order, and at the right height, and get the wires to connect. He is now officially done with DIY and I'm on my own, but all the ceiling-height work is done so I think I'm fine. Anyhow, we had bought the little (plastic!) ceiling medallion when we put up the chandelier, but forgot to put it up. It is necessary because there's a big ugly hole in the ceiling tile (this place and the ceiling tile!) that isn't fully covered by the light ceiling mounting plate thing (edit: canopy. See above where I don't know lighting terminology). I know it looks really tilted in the photo but it's not nearly so bad in real life. I bought the brightest dimmable LED lightbulb I could find, because the original light fixture (pre-blingy-chandelier) had 3-4 bulbs and the kitchen needs as much light as it can get. I haven't installed the dimmer switch yet mostly because I think the heat went off when I switched the breaker and it's just too cold to risk that. But it'll look so great on a dimmer when we have a meal at the table, or if we have people over! And I can crank it up to 11 when I cook, as I require professional-kitchen level lighting or I get grumpy. 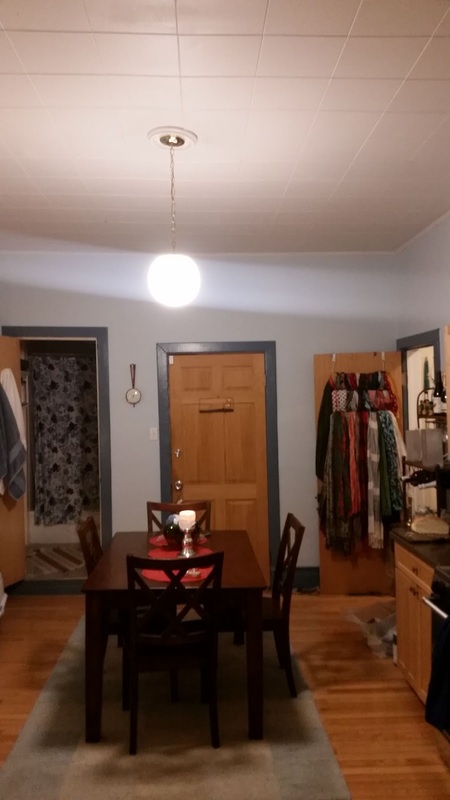 In this photo you can also see the boring nondescript trim in the kitchen. The tiny bathroom is on the left, the two windows are on the wall to the left of that, and next to them is the sink and some cabinets. The door to the basement stairs and back porch is in the back. The door to "my room," aka the spare room, is in the right hand corner, and next to it is a strange piece of furniture we use to store liquor and spare glassware (we have SO MUCH glassware), and then cabinets on that wall include the stove and fridge. I want to replace the strange liquor cabinet with a nicer one, that doesn't have ugly faux-rustic metal scrolls on it. Maybe I could use one of our two identical leaning bookshelves, as husband and I both owned one before I moved in. Here's the living room couch, which is a gigantic dark brown suede-like sectional. 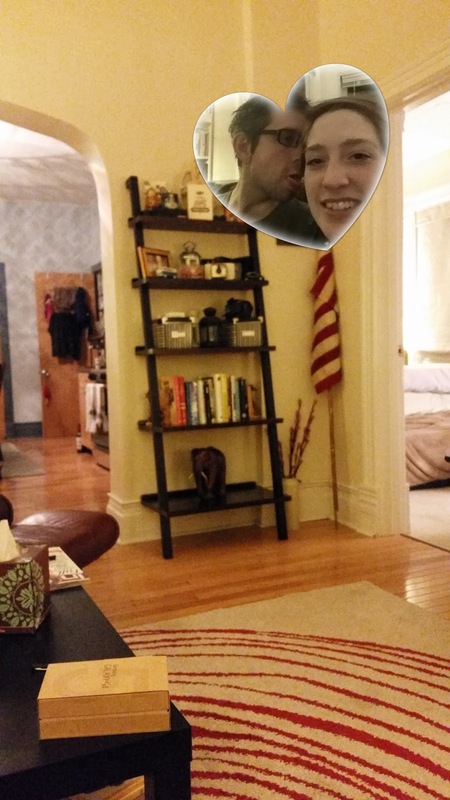 I was looking through my phone for photos of the apartment and there is a massive collection of photos of us and/or the cat on this couch, so it is basically where we spend 95% of our time. It is a little bit ugly but extremely comfortable. I got a lot of light-colored pillows to try to make it look better. 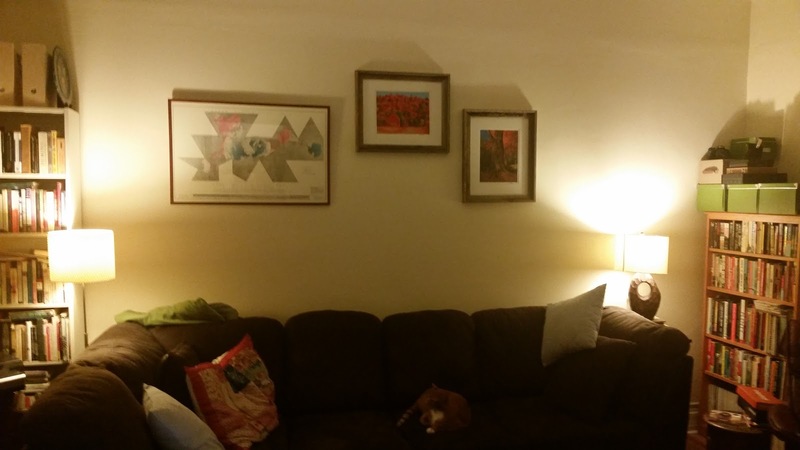 I also put up one more painting on the wall as I thought this looked like there's a gap. I bought the map of the world that looks like a strange geometric shape for $20 at Brown Elephant thrift store. It's a Buckminister Fuller projection showing ocean temperatures, and it's awesome. Previously he (husband, not Buckminister Fuller) had a non-working weird modern clock there, and while I see (kindof) where he was going with the asymmetry, it just wasn't working for me. I don't want to hear that we hang the art too high-- we are both tall and the ceilings are tall and just let us live, ok? The tall bookshelf on the left has been mine since the apartment after college. It's a Billy and it's much more stable than the wider standard-sized Billys. My wide Billy fell down spontaneously in a giant crash on New Years Eve, after listing to the right dangerously for months, so I'm on the hunt for a replacement. The nice solid wood bookshelf on the right has been his since he bought it at a proper furniture store in New York. I tried to get him to let me spray paint the oval-with-cut-out wood lamp base gold but he said no. I just think there's too much dark brown going on in here. See, he does love me! This was taken before the kitchen light installation, so I guess it actually proves nothing, except that we are weird adorable and I had just gotten a new phone to play with. This is taken from short end of the sectional couch. You can see the door to the bedroom and the cool archway opening into the kitchen with the spare room door open in the background. That's an IKEA rug and IKEA coffee table, and one of our two leaning bookshelves (the other is in the basement, awaiting its next role). See the strange underwater rippled effect on the blue wall of the kitchen? That's from the blingy chandelier! When I convinced my boyfriend or fiance at the time to buy it because it was on sale, he had a voucher, and it was fabulous, I didn't realize it would do that, effectively dimming the light and generally just being Too Much. When I saw the same chandelier in multiples in a River North bar, I knew I had made a mistake. The blue walls with dark blue trim in the kitchen were another one of my ideas that I regret. Boyfriend did all the painting, but I gave him the idea, and now I feel guilty. You should have seen the walls before, though. They were tan with brown faux-aged sponging. I think the trim was a nondescript but beigeier tan. They were hideous. Together with the light brown wood floors, light brown wood cabinets, faux-aged metal chandelier, faux-aged metal liquor cabinet, and dark wood furniture, it was a brown abomination. However, white on white is what we should have chosen for the walls and likely will repaint. The apartment is too small for creative trim colors, in my opinion. Anyway, it's coming together, slowly. I try to get rid of things, style bits and pieces as I go. For example, I want get rid of a lot of glassware, which is so hard for me, and get some boxes or even shelves to contain the random mess on top of the cabinets, but more on that later. You can even see that I've improved the capacity of the spare room door to hold my entire 54 scarf collection. 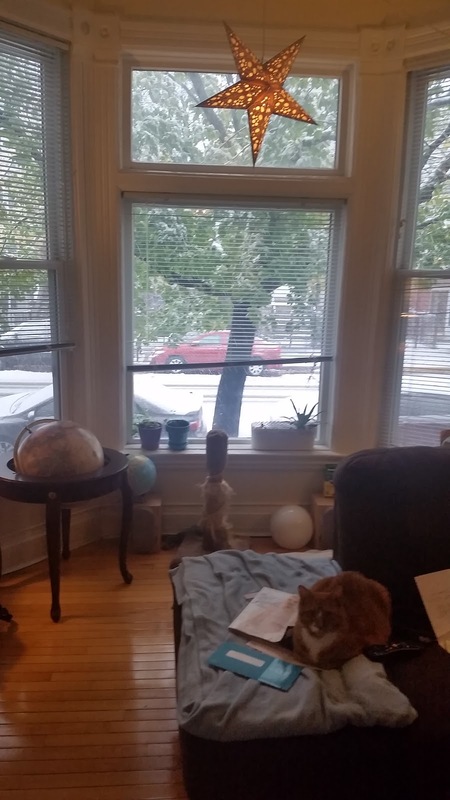 The issue with this apartment is that there are no closets besides the two tiny bedroom closets, so stuff that needs to be reasonably accessible (only long-term storage in the basement) has to be crammed in somewhere basically in full sight. I plan to address this partly with my larger, better, more sturdy shelving unit in the spare room. To be continued.